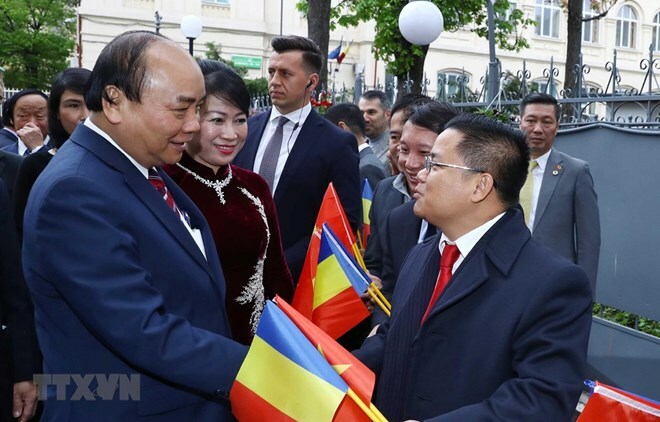 Prime Minister Nguyen Xuan Phuc and his entourage had a meeting with representatives from the Vietnamese community in Romania and the staff of the Vietnamese Embassy in Bucharest on April 14 as part of his official visit to the European country. The overseas Vietnamese present at the meeting expressed their joy at the recent socio-economic development in the home country, and proposed that the Vietnamese Government bolster cultural exchanges with Romania, and crated favourable conditions in terms of legal framework for economic and cultural cooperation between the two countries. They reported that the Vietnamese community in Romania numbers about 500, and the community show strong solidarity and mutual support in their daily life and integration into the host society. PM Phuc affirmed that overseas Vietnamese, including those in Romania, are an integral part and an important resource of Vietnam. He informed that the Vietnamese Government has implemented many programmes to help the OVs preserve their cultural characteristics including the mother tongue, and called on the community to continue support their homeland in national construction and defence. The PM said he plans to hold talks with his Romanian counterpart and meet with several Romanian leaders, during which he will ask Romania, in the capacity as the rotary chair of the EU in the first six months of 2019, to advocate the early signing of the EU-Vietnam Free Trade Agreement (EV FTA). PM Phuc is making an official visit to Romania at the invitation of Romanian Prime Minister Viorica Dancila.